Got an idea for a new tech initiative in your school but wondering where to find the money to pay for it? Grants from corporations and foundations may be just the funding source you need. Stan Levenson has raised $50 million-plus for the public schools where he has worked and consulted, including $16 million for Sweetwater Union High School District in Southern California, where he served as coordinator of special projects for 13 years. 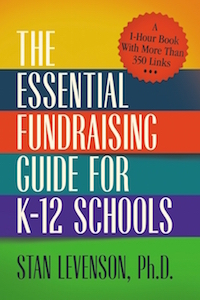 Since that time he has written three books on how to help schools raise money, including the newly published The Essential Fundraising Guide for K-12 Schools. Recently, Levenson offered advice on how to fund technology projects specifically with corporate and foundation grants. The first step is to come up with an "innovative idea and vision," Levenson said. Pull together a committee of two to five people "who share your passion" and are willing to help with the work. Then get school or district leaders to support the idea. You'll want that for a couple of reasons. Practically speaking, because you'll be developing grant applications, responding to requests-for-proposals or filling out other applications, you could request "release time" from your regular work to compile that paperwork. Second, without administrator support, you may have a tough time persuading a program office at the foundation or corporation that the initiative really stands a chance of success. Levenson strongly encouraged the inclusion of "technology savvy" committee members. As he explained, "There's nothing worse than a grant writer with no knowledge of technology trying to write a technology project." Also, at least one team member should have some grant writing experience, he said. How much should you go for? 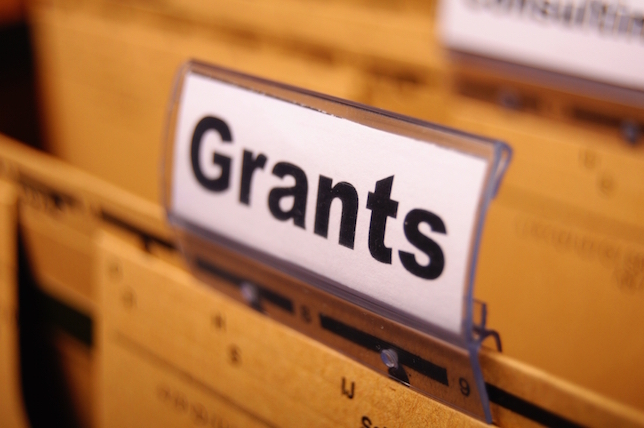 If you're pursuing a grant for the first time, Levenson suggested staying at or below $5,000. However, he noted, "If you are representing a large, urban school district, I would say the sky is the limit." Corporate and private foundations tend to specialize, and many are interested in funding K-12 education programs, said Levenson. Even here, however, he offers a caveat in his book: "It is usually easier to obtain monies from local and statewide corporations and foundations rather than national foundations that traditionally fund projects having national implications and significance." In fact, he emphasizes pursuing grants from corporations and foundations in your local community. How do you find them? Levenson's book includes hundreds of links to potential funding resources online. But one resource will be of particular interest: Foundation Center runs Foundation Directory Online, whose tens of thousands of records can be searched free by grantmaker name and location. Five levels of paid membership give ever-increasing amounts of searchable information about the funder. But even at the free level, users can click through to find more information about a given organization. If you're in an area where the immediate local community has no big companies or foundations, he recommended pursuing those grantmakers "located as close by as you can find them." Once you've identified some go-to sources for funding, spend some time understanding what kinds of organizations they support and their grant processes. Most foundations will have yearbooks and application forms on their websites or available by mail with a phone call. (Yes, it's true; some foundations have no Web site.) Another useful source for uncovering this information is the publicly available annual Form 990-PF, filed with the Internal Revenue Service, Levenson explained. Flipping through that will help you uncover what grants have been made and their sizes, along with the names of the trustees and officers. Levenson added that one of the most common mistakes new grant applicants make is "not doing enough research to match up your needs and the corporation or foundation's interests." Although every RFP or grant application you fill out requests information specific to its funding process, some content won't change much from one form to another. An example of this would be the explanation of the program. Levenson's book goes into detail about the six basic components of any grant application. One of those elements is the "needs assessment," where you lay out the problem you hope to tackle — the reason you're asking for the grant. Another is "objectives." Levenson suggested dividing those into program and process objectives. The first kind "specifies the outcomes of your project — the end product." He recommended that these be "measurable and time specific and become the criteria by which your program will be evaluated." The second kind is written to help the grantmaker understand what activities will occur to meet the program objectives. He also encouraged marking important deadlines for the grants you choose to pursue on your calendar so you don't miss them. Personal contact can go a long way to getting traction with fundraising from corporate and private foundations. Persuading a corporate executive or foundation program officer to spend time on the phone hearing about your ideas is the start of what Levenson calls the "nurturing process." His advice: "Make certain that you are thoroughly familiar with your project and that you are able to discuss it with clarity, conviction and strength." If you get feedback in these conversations, make sure to "incorporate any relevant suggestions for improvement" into your grant application. "One of the questions you should be prepared to ask the program officer or his or her assistant is: 'Would you recommend that we apply for this grant?'" Levenson suggested. If there's interest on the part of the foundation officer and you're requesting a "considerable amount of money" ($25,000 or more), Levenson advised asking for an appointment to visit the foundation with a school or district administrator in tow. "This person-to-person contact, especially with the heads of both organizations, could do wonders for your ... fundraising effort," he said. If visiting the foundation isn't possible, invite the program officer or other staff member to come see your school's programs and meet with you and other school representatives (including district and school leaders) personally. Levenson's book lays out a carefully choreographed plan of action for those visits to ensure you maximize the time. If you succeed, Levenson noted, "then you are on the right track for getting funded." Sometimes this step requires filling in an application; other times it's simply necessary to respond to the corporation or foundation's guidelines. "Always give the funding agency exactly what they ask for — nothing more, nothing less," stressed Levenson. Once the response is drafted, "go over it carefully to correct spelling, typographical errors, grammar and word usage." Then, he suggested, have others in your field of interest and not in your field of interest read the application for clarity and input. Ask for assistance from the business manager, accountant or site principal when formulating the budget. Send those documents in with a "cover letter that 'grabs' the reader," he said. That's usually a single page that provides a summary of the project. Then it's time to wait. "Usually, the funding agency will have a schedule of when they will notify you as to whether you are funded or not," Levenson noted. "If you don't hear on the date indicated, it would be prudent to contact the funding agency." Levenson has seen every mistake possible made during his years in helping schools find the funding they need for their projects. Among the most common in the early stages: "Pursuing grants out of their state or area — unless they are an urban school district; applying for a grant in a subject area that the foundation isn't interested in; trying to write a grant application with little or no experience or time to write; not getting support from the administration, school board [or] community." During the later stages, people trip up in "not meeting the deadline; not having needs; not having measurable objectives; not having realistic goals and objectives; not presenting an evaluation plan that ties into the goals and objectives; not having a realistic budget [or] a dissemination plan." That said, Levenson continues to be "optimistic" that corporate and private foundations "will continue to fund technology well into the future."